There are snips of folkore surrounding this elder statesman of the piano, but aside from slights about his teaching etiquette and temperament, I’ve always adored Menahem Pressler’s artistry. An “old” 1974 recording of the pianist’s Mozart’s Bb Concerto, K. 450 is an ambrosian delight. The playing is pure singing poetry permeated by impeccable phrasing. An attentive listener will imbibe music that is like fine wine. Pressler insists that we must be “in love” with a composition we are studying or performing–to own a passion for the composer’s creation and do our utmost to realize the style, emotion, affect and nuance that was intended. By example, Pressler shows us the way. In the late 1960’s, as a Merrywood music camper exposed to Tanglewood’s riches, I made a weekly journey to the Chamber Music Shed to hear performances of the Budapest String Quartet and The Beaux Arts Trio of New York, among others. On one special Wednesday in 1961, Menahem Pressler’s Trio including Bernard Greenhouse, cello and Daniel Guilet, violin, played a program of Beethoven, Chausson, and Schubert. The evening was made memorable not only for its inspired music-making and autographed program insert but for a spiritual essence that became my constant companion. Menahem Pressler, founding member and pianist of the Beaux Arts Trio, has established himself among the world’s most distinguished and honored musicians, with a career that spans over five decades. Now in his 87th year, he continues to captivate audiences throughout the world as performer and pedagogue, performing solo and chamber music recitals to great critical acclaim while maintaining a dedicated and robust teaching career. 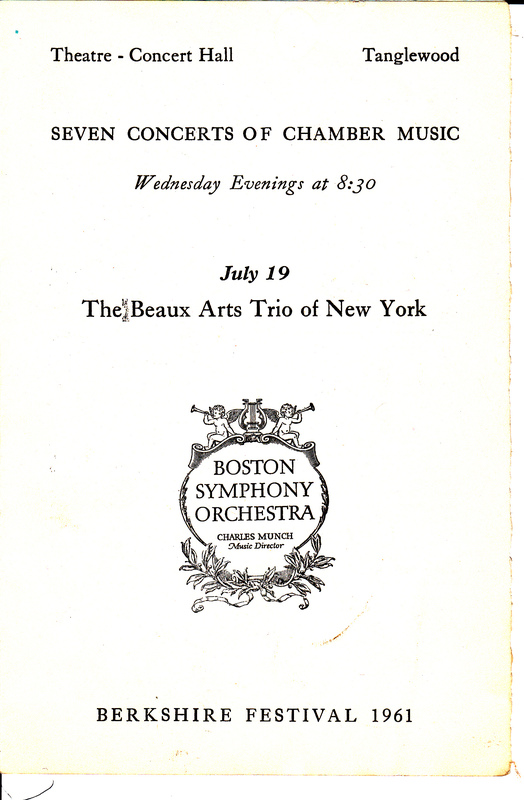 After nearly a decade of an illustrious and praised solo career, the 1955 Berkshire Music Festival saw Menahem Pressler’s debut as a chamber musician, where he appeared as pianist with the Beaux Arts Trio. This collaboration quickly established Pressler’s reputation as one of the world’s most revered chamber musicians. With Pressler at the Trio’s helm as the only pianist for nearly 55 years, The New York Times described the Beaux Arts Trio as “in a class by itself” and the Washington Post exclaimed that “since its founding more than 50 years ago, the Beaux Arts Trio has become the gold standard for trios throughout the world.” The 2007-2008 season was nothing short of bitter-sweet, as violinist Daniel Hope, cellist Antonio Meneses and Menahem Pressler took their final bows as The Beaux Arts Trio, which marked the end of one of the most celebrated and revered chamber music careers of all time. What saw the end of a one artistic legacy also witnessed the beginning of another, as Pressler continues to dazzle audiences throughout the world, both as piano soloist and collaborating chamber musician, including performances with the Juilliard, Emerson, American, and Cleveland Quartets, among many others. For nearly 60 years, Menahem Pressler has taught on the piano faculty at the world renowned Indiana University Jacobs School of Music where he currently holds the rank of Distinguished Professor of Music as the Charles Webb Chair. Equally as illustrious as his performing career, Professor Pressler has been hailed as “Master Pedagogue” and has had prize-winning students in all of the major international piano competitions, including the Queen Elizabeth, Busoni, Rubenstein, Leeds and VanCliburn competitions among many others. His former students grace the faculties of prestigious schools of music across the world, and have become some of the most prominent and influential artists and teachers today. In addition to teaching his private students at Indiana University, he continuously presents master classes throughout the world, and continues to serve on the jury of many major international piano competitions. Among his numerous honors and awards, Pressler has received honorary doctorates from the University of Nebraska, the San Francisco Conservatory of Music and the North Carolina School of the Arts, six Grammy nominations (including one in 2006), a lifetime achievement award from Gramophone magazine, Chamber Music America’s Distinguished Service Award, the Gold Medal of Merit from the National Society of Arts and Letters. He has also been awarded the German Critics “Ehrenurkunde” award, and election into the American Academy of Arts and Sciences. In 2007 Pressler was appointed as an Honorary Fellow of the Jerusalem Academy of Music and Dance in recognition of a lifetime of performance and leadership in music. In 2005 Pressler received two additional awards of international merit: the German President’s Deutsche Bundesverdienstkreuz (German Cross of Merit) First Class, Germany’s highest honor, and France’s highest cultural honor, the Commandeur in the Order of Arts and Letters award. Menahem Pressler, founding member and pianist of the Beaux Arts Trio, has established himself among the world’s most distinguished and honored musicians, with a career that spans over five decades. Now in his 86th year, he continues to captivate audiences throughout the world as performer and pedagogue, performing solo and chamber music recitals to great critical acclaim while maintaining a dedicated and robust teaching career.Born in Magdeburg, Germany in 1923, Pressler fled Nazi Germany in 1938 and emigrated to Israel. Pressler’s world renowned career was launched after he was awarded first prize at the Debussy International Piano Competition in San Francisco in 1946. This was followed by his successful American debut with the Philadelphia Orchestra under the baton of Maestro Eugene Ormandy. Since then, Pressler’s extensive tours of North America and Europe have included performances with the orchestras of New York, Chicago, Cleveland, Pittsburgh, Dallas, San Francisco, London, Paris, Brussels, Oslo, Helsinki and many others.